The 57 WG is home to advanced air combat training. The wing provides training for composite strike forces which include every type of aircraft in the Air Force inventory. Training is conducted in conjunction with air and ground units of the Army, Navy, Marine Corps and air forces from US allied nations. The crews do not come to learn how to fly, but instead learn how to be combat aviators. Established in July 2005, the 57th ATG consists of Aggressor squadrons that replicate adversary threat tactics while training combat air forces aircrews. Composed of 16 squadrons, the U.S. Air Force Weapons School teaches graduate-level instructor courses that provide advanced training in weapons and tactics employment to officers of the combat air forces. "America's Ambassadors in Blue," the Thunderbirds have performed for more than 300 million people in all 50 states and 60 countries around the world. USAF's most diverse maintenance group with over 2,200 Airmen, civilians and contractors in 3 squadrons, 8 Aircraft Maintenance Units, 13 flying hour programs and Air Combat Command's largest A-76 backshop service provider contract worth over $230M. Provides sortie generation, munitions and on- and off-equipment maintenance for 132 assigned A-10, F-15, F-16, F-35A and F-22A aircraft to support the test, tactics and training missions. Provides graduate-level instruction to maintenance and munitions officers and senior non-commissioned officers to perform as expert field level logistics leaders. The Thunderbirds and the USAF Advanced Maintenance and Munitions Operations School report directly to the 57th Wing commander. See 57th Operations Group for complete lineage and timeline information. See 57th Adversary Tactics Group and USAF Weapons School for the flying components of the 57th Wing. 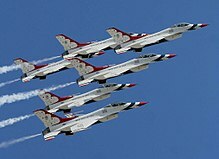 See USAF Air Demonstration Squadron for the United States Air Force Thunderbirds. Established on 15 March 1948, the 57th Fighter Wing replaced 57th Fighter Wing (Provisional) in April 1948. It operated Elmendorf AFB, Alaska, and several satellite bases, and provided air defense of Alaska, April 1948-December 1950. In addition, the wing provided intra-theater troop carrier and airlift support, 1948–1950, using several attached troop carrier squadrons. In January 1951, it was replaced by 39th Air Depot Wing. The 57th moved to Nevada and replaced the 4525th Fighter Weapons Wing at Nellis Air Force Base, in October 1969. At Nellis, it trained tactical fighter aircrews, conducted operational tests and evaluations, demonstrated tactical fighter weapon systems, and developed fighter tactics and from February 1970 to October 1979 and operated Nellis AFB for all base tenants. The USAF Air Demonstration Squadron (the "Thunderbirds") was assigned to the wing in February 1974 and has remained an integral part of the wing to present. The 57th assumed operational control of "Red Flag" exercises in October 1979; developing realistic combat training operations featuring adversary tactics, dissimilar air combat training, and electronic warfare. It incorporated intelligence training after March 1980. In 1990 the aggressor mission transferred to 4440th TFTG and later to the 414th CTS. The wing added instruction in hunter/killer counter electronic warfare tactics until 1996. From 1992–1999, the wing operated detachments at Cannon Air Force Base, New Mexico, Ellsworth Air Force Base, South Dakota, and Barksdale Air Force Base, Louisiana, that flew and tested the F-111, B-1, and B-52 respectively. It added the 66th Rescue Squadron, equipped with HH-60 helicopters, on February 1, 1993, while the squadron was deployed in Southwest Asia. From 1991 to present, the 57th provided combat aircrew capabilities, operating the USAF Weapons and the USAF Combat Rescue Schools, developing techniques and procedures and conducting operational test and evaluation on all major aircraft in the AF inventory. With the reactivation of the 432d Wing at Creech Air Force Base on May 1, 2007, the elements that comprised the 57th Operations Group, were transferred to the 432nd Wing. Redesignated: 57th Wing on 15 June 1993. *Note: The 57th Fighter Wing (Provisional) was established on 16 April 1947 at Fort Richardson, Alaska, as one of the "Base-Wing" concept provisional Table of Distribution (T/D) organizations. The provisional wing was inactivated and replaced by the 57th Fighter Wing in March 1948 (exact date unknown). 4443d Tactical Training Group: January 26, 1990 – November 1, 1991. 509th Weapons Squadron: 2006 - Present. Located at Fairchild AFB WA. Wikimedia Commons has media related to 57th Wing.